Macau, July 16, 2009 – City of Dreams is a brainchild of Lawrence Ho back in 5 years ago, an integrated entertainment resort is set to become the “must experience” destination in Macau. Developed by Melco Crown Entertainment Limited, an entertainment company listed on the NASDAQ Global Select Market (NASDAQ: MPEL), held its official grand opening ceremony in June 2009. Leigh & Orange is proud to have performed as the Executive Architect of City of Dreams. Located in the heart of Cotai in Macau, City of Dreams combines electrifying entertainment, stylish nightclubs, an amazing array of accommodation, regional and international dining, designer-brand shopping, as well as a spacious and contemporary gaming experience. The initial opening of City of Dreams features a 420,000-square-foot casino with approximately 520 gaming tables and approximately 1,350 gaming machines and 2 iconic hotel towers namely Crown Towers and Hard Rock Hotel providing approximately 600 guest rooms. Initial opening also includes over 20 restaurants and bars; an impressive array of some of the world’s most sought-after retail brands; and The Bubble, an iconic and spectacular audio visual multimedia experience; extensive landscaping and waterscape features; parking and back of house facilities. Leigh & Orange Ltd. was commissioned to provide Executive Architect and statutory support services for the development and design services for the complete “Back-of-House” facilities for the initial opening of the project. 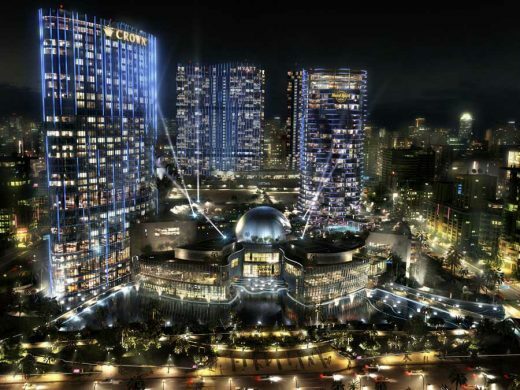 The project occupies 28 acres (10.6 hectares) and comprises two distinctly branded casino floors, three separate world-class hotels, Crown Towers, Hard Rock Hotel and Grand Hyatt Macau, and a unique lifestyle precinct, The Boulevard. On completion, the hotels will provide approximately 1,400 guest rooms and suites together with approximately 800 units of apartment hotel. The podium of City of Dreams provides a kaleidoscope of entertainment options for patrons. The impressively sized casino features with approximately 520 gaming tables and approximately 1,350 gaming machines. The Boulevard wraps around the casino floors and links with the three hotel towers. The Bubble Theatre, which accommodates the iconic multimedia extravaganza Dragon’s Treasure, housed approximately 500. Prominently located on the north-west edge of City of Dreams, fronting Cotai, Crown Towers offers the ultimate in opulence and innovation for those seeking refinement and attention-to-detail in every aspect of their stay. Featuring approximately 300 guest rooms, luxurious suites and villas together with exclusive gaming and spa facilities, the iconic tower with its elliptical plan expresses itself in a glass skin with randomly placed vertical fins resembling falling water and provides spectacular views of the dazzling lights of Cotai. The vibrancy of the hotel is juxtaposed with the pool deck, offering serenity, a magical place where the guest is taken to a garden refuge away from the realities of the world and engulfed in a tranquil sensory experience that embraces the pleasure of its wonderful spa. Centrally located, adjacent to the main entrance of City Of Dreams, this hotel has a defined musical edge and features approximately 300 guest rooms and suites, offering a unique experience in a relaxed, hip and energizing environment. Guests can take in the stunning views of Cotai at the lush pool deck and Wave, the Hard Rock pool bar, with its spiraling curved octagonal cantilever bands of the hotel as a back drop – the ultimate place for late night parties and entertainment. The amenity deck and fitness clubs for City of Dreams is a relaxing haven of tranquil serenity where the guest embraces the pleasure of a natural landscape with two spas. Cabanas, open lawns, sand volley ball court are thoughtfully situated and blended into the feature gardens and cater for a variety of activities. Swimming pools with pool bar and hot tub provide an unforgettable water experience while the semi-outdoor treatment rooms with their vitality pools, at the interface between the hotel and the deck, are welcoming venues for relaxation and uplifting the soul. With approximately 7,000 staff, the logistics of keeping City of Dreams operating 24/7 are extremely demanding. Leigh & Orange Ltd is proud to have been commissioned to provide design and documentation services for the Crown Towers, Hard Rock Hotel and Podium “Back-of-House” support facilities that form the hub to this vast operation. These areas create a city within the City and provide over 25,000 square metres of area which includes, staff facilities, uniform distribution centre, food storage and preparation, kitchens, dining areas, staff training, offices and staff lounges. Leigh & Orange Ltd led and closely coordinated with many other consultants and operators in the design development to realize this vast operational hub as support to the expansive public entertainment areas within the Podium. Local E&M Engineer: Jebsen Consultants & Engineering Co. Ltd. Interior Design (Crown Towers and Podium Casino) – Bates Smart Pty. Ltd.